As laptop makers go Toshiba is no slouch as they have proven with a long series of powerful and highly useful laptop computers. This comes in on the heals that the Toshiba brand of laptops tend to run with the bigger dogs as far as price. 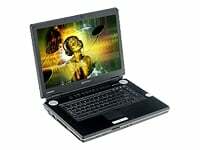 The price has not been a problem for most consumers when you consider the quality of the laptops themselves. Toshiba has marked itself as one of the finest makers and is constantly making improvements so the next model is better than the last. As for the F25, it is a mid range laptop with superior multi-media capabilities making it perfect for those who wish to play music and movies on a regular basis. There is also a fair amount of move around room for the overall computing process which has made this model a big hit with consumers who use them for work as well as play. This is combined with the sleek styling that marks nearly every Toshiba laptop manufactured thus far. To start with, the F25 offers a large screen which is a definite plus for those who want to watch movies on a regular basis. The over fifteen inches of viewing space features the TruBrite technology that is making it much nicer to view many items on the laptop. Tests have shown that the Toshiba F25 has far superior picture quality to those that are comparable in the market. The reason for this being the marketing strategy that Toshiba is going for is a media center laptop which is attracting the younger crowd to the company. While it is true that the Toshiba F25 has much more to offer, it is listed as a media center unit with other capabilities. There is no shortage of options when it comes to this media computer, and many are finding that it is best used as an all around unit which is cutting down on the need for more than one laptop. Once you add the superior quality of the large screen you have a combination that screams success loud and clear. To bring the media center theme to light even further, the Toshiba F25 has an integrated television tuner, something that is not often seen in this class of laptop. This feature comes in with the full service media dash board that comes standard on the Toshiba F25. To make the media center the easiest and fastest, Toshiba has added nearly every media feature on the dash board via a long series of buttons. One touch and the media features are up and ready to go. This has garnered a new found base of people who are interested in getting to the point a lot faster without all the pointing and clicking that is normally associated with bringing up the many media features that come into play on the computers of the day. This means that you can now bring the computer to life with the touch of a button; even as far as playing a DVD right on the unit without the access to the operating system via the one touch buttons on the dashboard. Many consumers are finding this series very useful and thoroughly enjoyable. Another wonderful draw of this particular model is the style in which it was made. The sleek black design is the perfect draw for the young and old alike. Using the design methods from previous models has made sure that those who love the Toshiba already are returning for the best and brightest in the new models while also bringing a whole new crop of people to the stores to pick up the F25 model. The downfall of the near mirror finish is the picking up of fingerprints. The casing and interior tend to look bad if you are not careful about how it is handled or the smudging may get to be annoying and unsightly to say the least. This is only a minor draw back for this model and most find that a little protection will do the trick. They sell a good many spray on chemicals that will guard against such things but you should be careful to purchase the correct thing as some may harm the finish or damage the screen. Toshiba has made every effort with the F25 to make it as user friendly and convenient as possible. Even though it is larger than the previous model, the weight is lower, only seven pounds. The new technology that was used in this model made it possible to lower the weight without sacrificing any of the power and appeal that it holds. The unit is also very durable to say the least. Tests have shown that it can survive a drop from a normal height dining table and receive only minor blemishes and no loss of power or use. Of course you should always take due care when handling a laptop as a fall from any range or distance is not good for it. But you will find that the Toshiba F25 is far more durable under normal use then that of other comparatively priced brands. All in all the Toshiba F25 is a wonderful model and offers all the use and power that many in the upper class of price do as well. The few minor issues include no S Video port nor a Component Out port but those are things that can easily be dealt with. There are three USB ports that are easily accessible and they are readily adaptable to the hubs that come in the lower prices ranges these days. This model also features a multi-layer DVD RW drive. While it is disappointing that it is located on the side rather than the front, you will still note that it is highly functional and of the highest quality. Check out the Toshiba F25 for the finest in mid range media center laptops. No matter what the purpose, the F25 offers the power and performance that is required for todays wired world.